If you haven’t noticed by now, we LOVE fluffy salads. Fruit, whipped cream, marshmallows, sometimes Jell-o mixed in . . . what’s not to love?! I have never known what to make with fresh cranberries and so when I saw this recipe, I thought that I would give it a try. It moved to the top of the fluffy salad list! 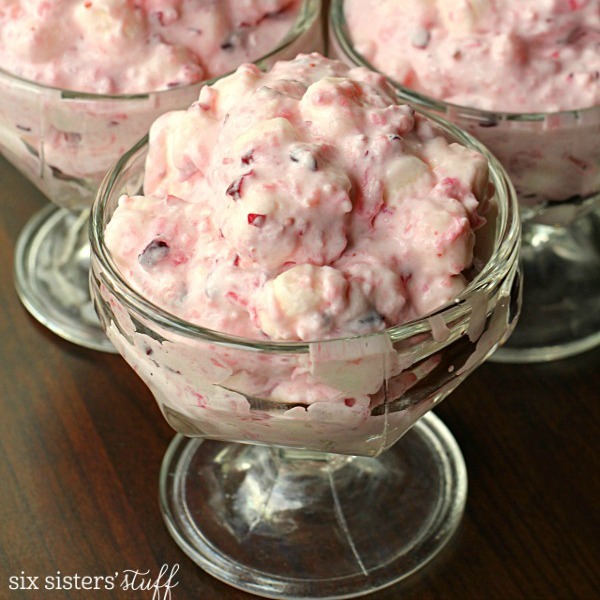 The tartness of the cranberries mixed in with the cream . . . it’s heavenly! So, if you need the perfect side dish/dessert for your holiday party, this is IT! Add fresh cranberries to a food processor or blender and pulse until they are finely chopped (if you like bigger pieces, you can pulse as little or as much as you desire). Place the chopped cranberries into a bowl and mix in sugar and pineapple. Cover bowl and place in the fridge for at least an hour to let the flavors meld. While the cranberry mixture is in the fridge, beat the cream cheese until smooth and then add in the whipped cream. Continue to beat until stiff peaks form (usually takes 3-4 minutes). Add the cream mixture to the cranberries and mix well. Fold in the marshmallows and then place back in the fridge for 3-4 hours to let salad set up. You can also make this salad a day in advance - just give it a quick stir before serving.